We’d love your help. Let us know what’s wrong with this preview of Joseph's Journey by Christina N. Smith. As a mother, how do you explain an absentee father to your child without anger, blame or resentment? Empower them! Seven-year-old Joseph shares his story about when he first learns about the POWER of choice he possesses after his father leaves and doesn't come back. His mother teaches him the difference between his father's choices and his own. Do Joseph and mom become ang As a mother, how do you explain an absentee father to your child without anger, blame or resentment? Empower them! Seven-year-old Joseph shares his story about when he first learns about the POWER of choice he possesses after his father leaves and doesn't come back. His mother teaches him the difference between his father's choices and his own. Do Joseph and mom become angry with Joseph's father? Well, a belief is just a thought you keep thinking over and over...Find out what happens on Joseph's Journey! To ask other readers questions about Joseph's Journey, please sign up. This book has a well-illustrated cover that would also be perfect for a paperback edition. Though it is not your typical bedtime story, it can be read to a child because it is short and well-written. Many children as well as mothers need to hear the message. The author takes a difficult subject for mothers and uses it to empower the child. Unfortunately, I have adult friends who still struggle with the absence of their father in their childhood. If their mothers had read a book like this to them This book has a well-illustrated cover that would also be perfect for a paperback edition. Though it is not your typical bedtime story, it can be read to a child because it is short and well-written. Many children as well as mothers need to hear the message. The author takes a difficult subject for mothers and uses it to empower the child. Unfortunately, I have adult friends who still struggle with the absence of their father in their childhood. If their mothers had read a book like this to them, perhaps they would be less confused as adults. A pleasant children's book answering a difficult question. The perspective offered within is "Power" and "Choice," and individualism. This approach is meant to empower children to make the right choices while accepting choices others make that they cannot comprehend. Reminiscent of a common prayer in contemporary western culture. Pop-up text bubbles on images are a helpful touch. A book received free of cost and reviewed. 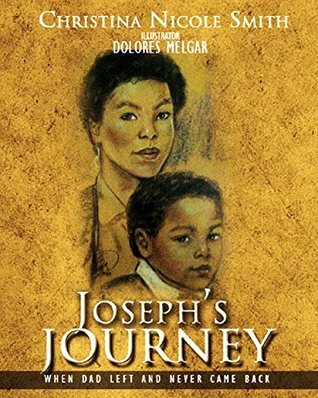 Joseph's Journey is very touching and empowering! The illustrations invite the reader in, and it's a sweet and mature book for kids and parents. We can benefit at any age from remembering the power of choice, how to live on and persevere even when we don't agree with other people's actions. This book is brave and champions the individual and kid in each of us. You will learn something from it, I did. Christina Smith is an entrepreneur, consultant, mother, and award-winning author. "Joseph's Journey" is her first children's picture book. Born and raised in the Bay Area, she grew up in a house with 3 children, WITHOUT the white picket fence and no dog! However, there was lots of love and laughs to go around. When she was about 10 years old, she thought she was going to be the "next coming" of Who Christina Smith is an entrepreneur, consultant, mother, and award-winning author. "Joseph's Journey" is her first children's picture book. Born and raised in the Bay Area, she grew up in a house with 3 children, WITHOUT the white picket fence and no dog! However, there was lots of love and laughs to go around. When she was about 10 years old, she thought she was going to be the "next coming" of Whoopi Goldberg! Well, "life happened" and "that" did NOT happen, but in 2014 she was able to cross ONE ITEM off of her bucket list and perform stand-up comedy in front of a live audience. When she's not homeschooling her son or driving him all around town to his various activities, some of Christina's favorite things to enjoy are: the local library, a throw-your head back, "that brought tears to my eyes" kind of laugh; organic, gluten-free, dairy free, non-gmo food and good music. Christina is a certified graduate/alumnus of, certified professional speaker/author, George Ramirez' "Present with Purpose" (2008) & two-time student of his "The Miracle in the Mirror" programs. She has received a Certificate of Recognition from California State Assembly in Honor of Graduating from the Women's Initiative for Self Employment and dedication to empowering the quality of her life and her community (2007). Additionally, she is a student of Certified Rebirthing-Breathwork Practitioner, Iris Watson (Nelson). She holds an Associates degree in Legal Administration/Paralegal Studies from Heald Business College.